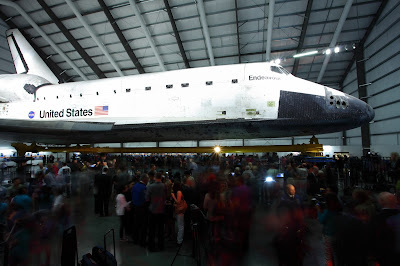 The California Science Center will observe its 20th anniversary on Feb. 7. Since opening, more than 33 million guests have come through the doors, making the Science Center one of the most visited museums in the nation. Families, adults, and school children on field trips have toured the permanent galleries, special exhibitions, viewed live demonstrations and watched IMAX films where science is the star. The Science Center was envisioned as a destination that would stimulate curiosity, inspire science learning and enrich people's lives by creating fun, memorable experiences because we value accessibility, inclusiveness and science, as an indispensable tool for understanding our world. In the 20 years since the California Science Center opened, it has become a world class, global destination and has fulfilled this vision with engaging memorable experiences for everyone including: Space Shuttle Endeavour's journey across country and through city streets to its display in the Samuel Oschin Pavilion; the presentation of exceptional exhibitions like the permanent gallery Ecosystems; Pompeii: The Exhibition; Star Wars: Where Science Meets Imagination; and Gunther von Hagen's BODY WORLDS; as well as enhancing visits through IMAX films shown on a movie screen seven-stories high. California Science Center President and CEO, Jeffrey Rudolph said, "As the Science Center continues to implement its visionary 25-year Master Plan, we look forward to even more transformative projects that will inspire a new generation of scientists, innovators and explorers, such as the new Samuel Oschin Air and Space Center." He continued, "We are celebrating our 20th anniversary with the international launch of King Tut: Treasures of the Golden Pharaoh, opening in March 2018." Formerly known as the California Museum of Science and Industry and located in a series of standalone buildings, museum officials gave thought to how to best engage the public in the 21stcentury. In 1990, a 25-year Master Plan was created, including a first-rate educational exhibition center, an onsite K-5 elementary school and a professional learning center for educators and parents, all in one location. The museum was rebranded, becoming known as the California Science Center, and the exhibit program was re-imagined with themed areas and a focus on hands-on exhibits. Phase I included permanent galleries World of Life, Creative World, Air + Space, previews of future plans and an IMAX Theater showing 2D and 3D films on a giant movie screen. The Samuel Oschin Air and Space Center is the primary component of Phase III of the Science Center's 25-year Master Plan. The new facility will integrate authentic artifacts, including a diverse collection of aircraft and spacecraft, immersive experiences and hands-on, educational exhibits that encourage active learning through discovery. A focal point will be Endeavour, coupled with a fuel tank and solid rocket boosters, on display in the vertical or launch position. With this new extension, the California Science Center will be the largest science center in the western United States. Science Center officials will observe the anniversary festivities with board members, trustees, donors, stakeholders, employees and volunteers. The public will be invited to join in the celebration by sharing their memories and photos on social media and should follow the Science Center on Facebook, Twitter and Instagram for details.